My head and my heart have been in a million places over the past two months since I last posted. I seem to be unable to focus on anything very well… very scattered I would say in regards to my thoughts. And because I am a perfectionist I refuse to write anything unless I know exactly what I am going to say and how I am going to say it. But here I am today… still unsure of what I want to say but knowing that I want to say something. The purpose of this blog is for me to relay to you what God is teaching me; through His Word, through people, through experiences…. so what is God teaching me you ask. To be honest, I am tired. And I am weak. God has been revealing things to me about the condition of my heart… and I am now faced with the inevitable choice of allowing Him to change me. And that, my friends, is a hard thing to do. In order for change to occur one has to recognize the need for change…. I am realizing just how inadequate I am. There are many things that I would love to share, but for today I will share with you the hardest struggle I face. This is not a new struggle. I can look back over my life and see it playing out over and over again. Worry does not seem like such a huge issue, we all worry right? …except that worry really comes down to one thing and that is complete distrust in God. I am learning that I really don’t trust God. I am afraid for me to not be in control. I am afraid of what will happen if someone else is making decisions for me. As a child I feared death (among other things) and would lay in my room at night crying as I would think of these elaborate stories of how I might die, or those around me might die… I fear the unknown… and really I fear what I know as well… I fear that a decision might be made for me… one that may cause severe pain and hurt. So, I have had to face my greatest fear head on. I faced my son dying. I faced that severe pain and hurt… and now a year and a half later my heart is still aching and I am still afraid… maybe more than ever. We have a monitor that lays under Asher’s mattress. An alarm will go off if the monitor does not detect movement (i.e. breathing) and yet I will still plead with Aaron to check on him when he’s sleeping. I mean why would I trust a piece of electronic equipment… I know too much… I know that if God saw it best for Asher to join Him as well, a silly monitor would not stop Him. Case in point, about five minutes ago I had this mental image of Asher laying in his cradle and began to fear he had pulled his blanket over his head or had snuggled too close to the bumper… because of course I would have the child who even at such a young age loves to pull his blanky up by his face and snuggle so close to the bumper…. So, I came to Aaron and said “Baby, will you check on Asher… I’m scared.” Of course he did. He always does. But he isn’t afraid… because he trusts in a God who knows best, better than we ever could. You see, I don’t have the strength to ever check on Asher myself… a nasty bi-product of me being the one to find Aaden the morning he died. A special thank you to all my friends who put up with me…. so many of you I have asked “Would you check on Asher for me?” And they never ask why or look at me like I am crazy… they just sweetly go into him and make sure he is ok for me. Just the other day a friend and I were in the car together and I got scared… so without hesitation she unbuckled herself and turned around to check on him. Really? There is a problem here. I know in my head that God is in control. I know what the Bible says, that His plans are better than mine, that His ways are not my ways… that all things work together for good for those who love Him… but it still hurts to know that He allowed my little one to be taken from me… and that hurt produces a certain distrust. But here’s the thing. God does not owe me anything… and yet He gives me everything. As believers we sometimes associate our obedience to suffering… if we are obedient then God owes us and He won’t allow bad things to happen to us. We can look at the life of Job to see that that is an inaccurate view of God and the way He works. We are a sinful, fallen people, and because of that there will be pain, suffering and often… tragedy. But God gives us promise after promise… the storm may come but He is not going anywhere. 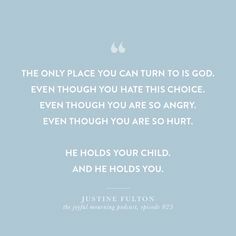 He is right there by my side… He never left me, in fact, He has been holding me all the time. He knows my tears and He knows my pain…. and He knows yours as well. I deserve nothing and He deserves everything… including my trust in Him and in His will for my life. I know all this to be true but I also know that it will be a long journey to be able to live out that truth…. « Grief at 17 Months.